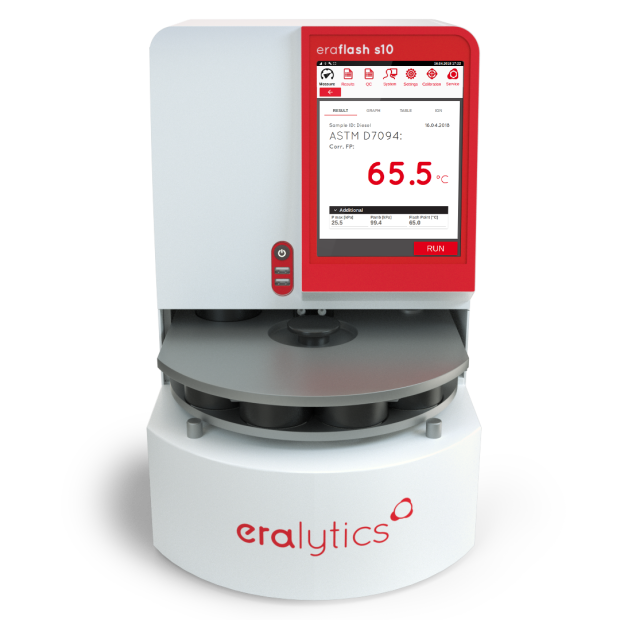 The latest addition to eralytics’ flash point tester series combines safest measurement with a 10-position autosampler. The inherently safe CCCFP methods ASTM D7094 and ASTM D6450 are ideal for unattended measurements. 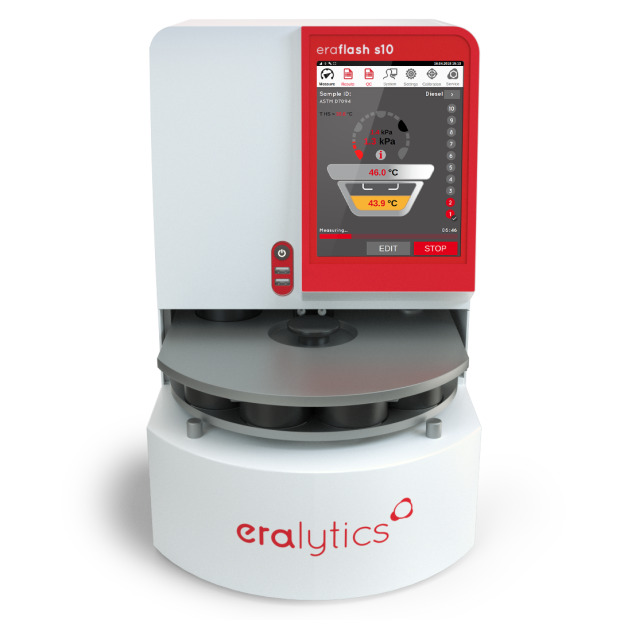 ERAFLASH S10 ignites the vapors of 1-2 ml of sample inside a closed chamber and measures the according pressure increase. ERAFLASH S10 is the first 10-position autosampler for flash point testing. It uses the inherently safe methods ASTM D7094 and ASTM D6450. With a low sample volume of 1-2 ml only and the continuously closed sample cups they are ideally suited to built a completely safe autosampler for flash point testing. This makes ERAFLASH S10 the ideal solution for unattended flash point testing. 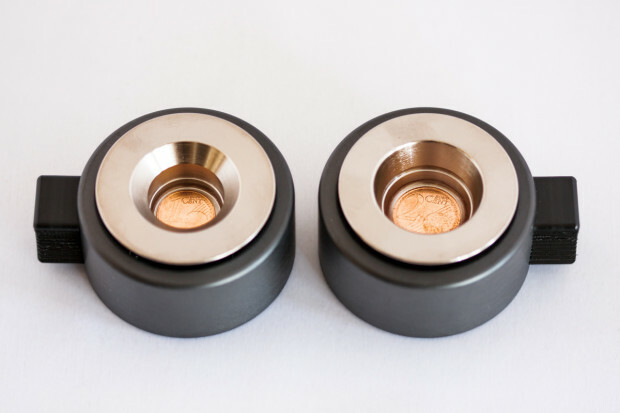 When looking at valuable products, especially with small batch sizes, flash point testing using the well-known Pensky Martens principle can consume a significant amount of sample, thus leading to high analytical costs. When performing flash point testing according to ASTM D7094 just 2 ml of the sample are needed. ASTM D6450 reduces this volume even further to 1 ml. 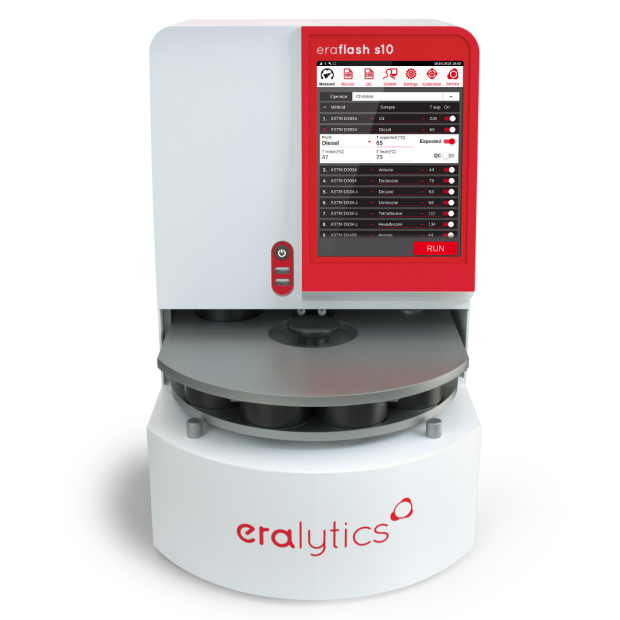 ERAFLASH S10 is therefore a welcome addition to testing labs handling large amounts of costly samples every day. This includes fragrances, paints and varnishes producers. Similar to eralytics’ single position flash point tester the patented PBT – Peltier Boost Technology™ allows flash point testing below 0°C (32°F) and above 200°C (392°F) with a single instrument. PBT separates the Peltier elements during the heat up at 100°C shielding them from higher temperatures that would normally harm them. During cool down, however, they can be used for active cooling starting at 200°C and thus reduce the turnaround time significantly. PBT also facilitates the same temperature range of -25°C (-13°F) to 420°C (788°F) of our single position flash point tester in an autosampler for flash point testing. 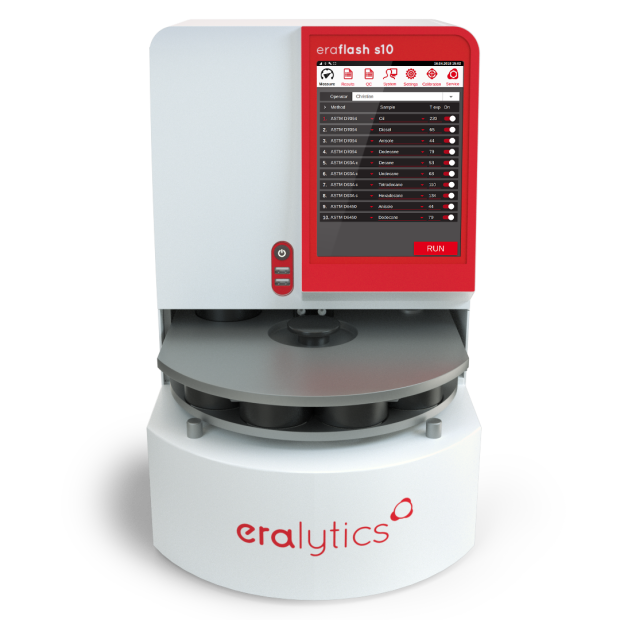 ERAFLASH S10’s optional cooling lid is an unsurpassed benefit, especially in applications that involve highly volatile samples. 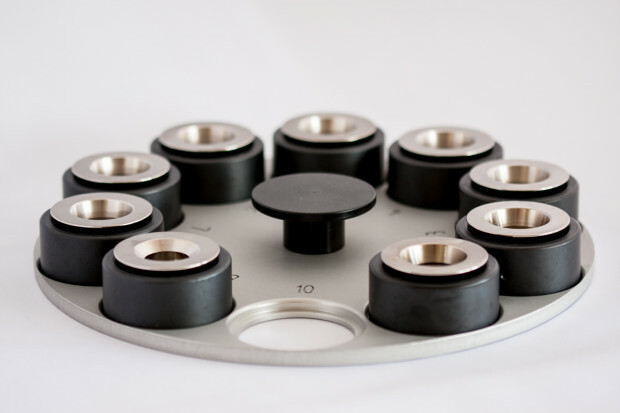 The lid keeps the pending samples at a stable temperature, which makes volatile compounds far less likely to evaporate before their measurement starts. Therefore, results are more precise and more reliable. 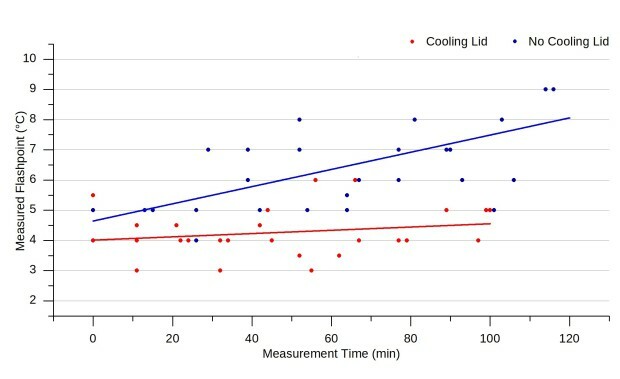 With pre-cooled sample cups cooling during the measurement can be less intense, which results in shorter turnaround times. During flash point testing the instrument visualizes the measurement procedure on the screen showing the sample and oven temperature as well as pressure gauge displaying the pressure increase after ignition. Additional information about the currently measured sample, as well as finished and still samples to be measured are displayed. After the measurements the flash point temperature is corrected for the atmospheric pressure and rounded to the next 0.5°C. All results will be saved in the corresponding result file. 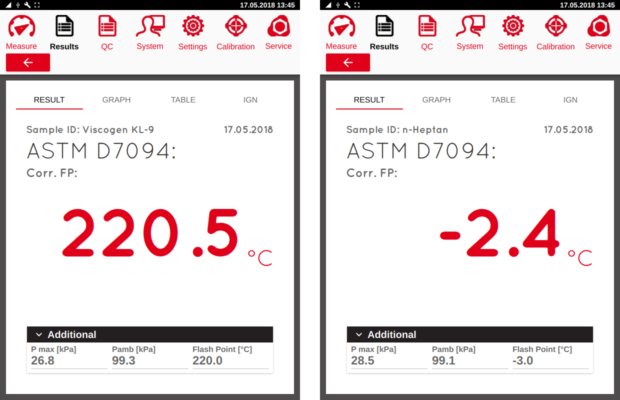 0 °C to 200 °C (32 °F to 390 °F) stand alone. No external cooling is required. Article on "ASTM D7094 - Modified Continuously Closed Cup Flash Point Standard Accepted as a Safe Alternative Method in Various Fuel Specs"